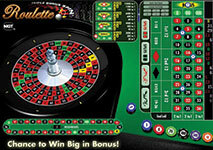 Roulette is a famous game which can be found nowadays in almost every land-based and web-based casino. Apart from the classic game, many casinos also offer a number of exciting variations in an attempt to attract more roulette enthusiasts and provide them with one-of-a-kind experience. Thanks to the huge diversity of variations, you can try a number of interesting roulette games and choose the one that suits your personal preferences and gaming style best. The many versions have different spinning wheels which alter your odds in one way or another. For instance, in European roulette the wheel has one green pocket, whereas in American roulette, it has two green pockets. The latter game is considered to be more unfavorable since its house edge is 5.26%, whereas in the first case is 2.70%. 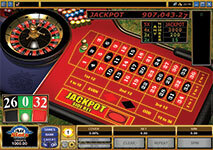 One of the variations which you can play in many online casinos is progressive jackpot roulette. The online casinos introduced this type of games as an attempt to allure more roulette fans and to give them the chance to win big while playing their favorite game. Nowadays, progressive jackpot roulette is so popular that it is safe to say that the online casinos have succeeded in achieving their goal. If you love playing roulette but you are somehow not content with the payout this game offers, then progressive roulette is the game for you. Progressive jackpot roulette games can be easily spotted as they have some very distinguishable features. As their name hints, this type of games include a jackpot whose amount is constantly increasing. Usually, every player who participates in them contributes to the ever-growing sum. As a result, the progressive jackpot games offer a life-changing amount that can be won by every participant. In most cases, the size the sum can reach is not fixed in any way, meaning that the jackpot will continue increasing until it is finally won. When it comes to progressive jackpot roulette, you need to know that the main rules of the game remain the same. If you are already familiar with them, you won’t have any trouble following the gaming process and playing. You can still place bets according to your personal preferences, meaning that you can choose to wager on one particular number or on several numbers. As you probably already know, it is also possible to put a bet on a number, depending on its colour or the category it belongs to – red/black or odd/even. In order to qualify for a jackpot, you are required to make a side bet. This wager is separate from your original bet, meaning that you still have to place an inside or an outside bet. Bear in mind that if you fail to place the side bet, you won’t be able to win the jackpot, even if you meet the rest of the requirements for it. The amount for this side bet is fairly small, one dollar per round in most cases, which makes it affordable to all players, regardless of their bankroll. Every time a player places this side bet, the amount of the jackpot increases. It should be noted that whenever someone wins this splendid prize, its amount doesn’t start accumulating from scratch. Instead, it has a pre-set sum to which it is reset in case it is won. This is the reason why it can reach such a colossal amount which makes these games worth playing. What sets these games apart from the classic roulette and from the rest of the variations, is the fact that they give you the chance to win big. Progressive jackpot roulette games are certainly a great way to diversify your gaming experience as they will let you feel the pleasant thrill of anticipation. By playing such a game, you are given various opportunities to leave the casino with a profit. Apart from the huge jackpot, you can also take advantage of some additional bonuses which have generous payouts. Some variations offer exclusive prizes if the number of your choice wins several consecutive times. Usually, the wheel of the games which feature exclusive bonuses, has extra pockets thanks to which you can increase your profit significantly. These extraordinary games are available thanks to some of the best software providers in the gaming industry – Microgaming, IGT, Playtech and others. Now, let’s have a look at some of the most popular such variations and their best features. Perhaps, the most popular variation when it comes to progressive jackpot roulette, is Roulette Royal. Since the game is developed by the prominent software provider Microgaming, it is no wonder that it gained popularity so quickly among roulette players. The fact that this version offers you many new opportunities to win, makes it extremely enticing. The general rule for progressive jackpot games applies here as well – in order to qualify for the jackpot, you are required to place a side bet that amounts to $1. You get to win the life-changing prize if the same number wins five consecutive times. Bear in mind that once you place the side bet, it will be put by default every time the wheel is spun. As already mentioned, this version gives you various ways to win and this shows in its many additional bonuses. For instance, you will be rewarded even if the same number appears only two consecutive times. In such case, the payout is 15 to 1, meaning that for your $1 bet, you will get in return $15. If the same number happens to appear three times in a row, the payout is set to 200 to 1 and for four times in a row – 3000 to 1. Due to the virtual nature of the game, you are also given the opportunity to take advantage of various exclusive features. For instance, you can keep track of your winnings much easier thanks to the history feature. Also, if you are a risk-taker, you can try the available Expert Mode thanks to which you can put a number of exotic bets. Playtech is another famous software provider which offers exclusively a progressive jackpot game to roulette players. One of the most distinguishable features this game has is the fact that its design includes some of the most popular Marvel characters. If you are a big fan of Marvel comic series and you also love playing roulette, this version might turn out to be your dream game. It offers an special Marvel bonus which you can win thanks to the additional blue pocket that is added on the spinning wheel. Providing that the ball lands on this pocket and that you have placed a bet on the Marvel bonus, you are given the opportunity to try your luck on an exclusive three-slots game. In such cases, you have the chance to make three spins which will determine the amount of the payout. The payout is different every time as it strictly depends on the Marvel characters you will get. You are required to collect three matching symbols in order to win a generous amount. Another great thing about this game is the fact that if offers you the chance to win four progressive jackpots. 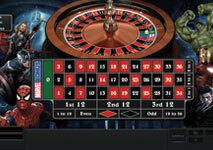 Triple Bonus Spin Roulette is an exciting variation which is available thanks to the innovative software provider IGT. Several major things set this version apart from the rest of the roulette games. One of them is the fact that in it, the spinning wheel features three pockets all of which contain zeros. It is also observable that it contains a yellow pocket that is different than the rest in terms of width. The yellow pocket is the place in which the ball should land so that a special bonus is activated. If this is the case, you are given the opportunity to spin a three-ring wheel. Depending on your initial bet and the outcome of this additional game, you will be paid accordingly. If you decide to play this game, you have the chance to place four bets that offer different payouts – Trio Bonus, Quad Bonus, Straight Bonus and Split Bonus. This extraordinary game will undoubtedly increase your level of excitement as you have various opportunities to win more money and improve your online gaming experience.